Vitamin A or Retinol is a fat soluble vitamin and is crucial for the development and maintenance of strong bones and teeth, to maintain clear vision and to maintain healthy skin. Working together, Vitamin A Retinol and carotenes, which are plant-based forms of fat-soluble Vitamin A, carry out many important functions. 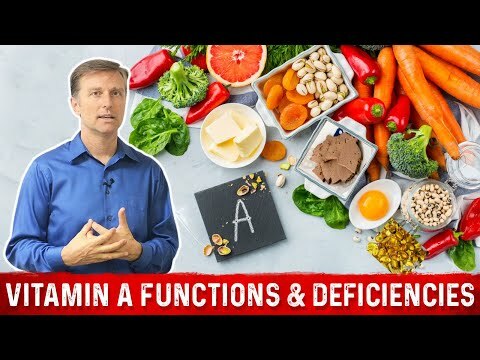 Of the over 600 carotenes that have been identified, 30 - 50 have been found to involve Vitamin A activity, which is why carotenes are included in the discussion. Carotenes are naturally-occurring, brightly colored plant pigments that are important in the photosynthesis process. Carotenes are what help protect plants as well as the body against the potentially damaging effects of antioxidants. By donating an electron, antioxidants are able to take away the power of free radicals. In other words, the free radical's ability to oxidize cells is eliminated. Oxidation of the body's cells is very similar to what happens when rust appears on a car. Once the cells inside the body start becoming oxidized, serious health complications often result. Some of these adverse conditions include heart disease, macular degeneration, arthritis, Alzheimer's disease and cataracts. Since Vitamin A is necessary to support healthy skin, it's been labeled the 'anti-aging' vitamin because of its ability to ward off wrinkles. Vitamin A also helps keep the mucous membranes inside the throat, lungs, eyes, mouth, digestive tract, kidneys, bladder and reproductive system healthy, which is why it's believed that Vitamin A helps enhance the body's immune system. To keep blood healthy, sufficient levels of Vitamin A are necessary to help increase the production of RNA. RNA is the part of the cell that includes the instructions for life. When RNA is rapidly reproduced it's able to help create new cells faster so that old and worn out cells can be efficiently replaced. Vitamin A also lowers cholesterol levels and assists with hormone production. Fish liver oil is one of the best naturally-occurring sources of Vitamin A. Cod and halibut are good sources as well. In addition, Vitamin A is found in fruits and vegetables, eggs and milk. Fruits with high vitamin A levels include nectarines, cantaloupes, apricots, mandarin oranges, plums, watermelons and mangos. Dark green and brightly-colored vegetables such as kale, collard greens, escarole, chicory, endive, romaine lettuce, broccoli, peas, carrots, red pepper, pumpkin, squash, turnips, sweet potato and tomatoes are excellent sources of Vitamin A. Ideally, adults should strive to get 5,000 IU of Vitamin A each day. When the body does not get a sufficient quantity of Vitamin A, the part of the body first affected generally is vision. In particular, the ability to see clearly at night or in dim light is hampered. Night blindness and even dry eyes are typical symptoms. In addition to eye trouble, various diseases of the skin including acne and psoriasis can result from insufficient levels of Vitamin A. A poor diet is frequently the cause of this type of vitamin deficiency. Particularly vulnerable are the elderly and those living in parts of the world where poor diets prevail.